Hurricane candle holders get their name from their ability to shield a candle flame from all but the stiffest passing breeze. It is thought that perhaps they originated in India, during the time when it was ruled by Britain. The “candle shades” as they were called were tall glass cylinders in which a candle or a coconut lamp could be placed. This was during the 18th century. Paraffin was less expensive than oil, therefore it became customary to put a chimney on a paraffin lamp. Natural oils were even less expensive. In 1780, Francois-Pierre Aime Argand invented a lamp with a glass chimney and a control knob to adjust the wick. The design caught on and was even translated into the classic lantern often depicted as hanging from the rafters of a ship. The adjustable knob that helped control the wick as it drew up the oil, and the glass that surrounded it helped to allow the protected light to ride out even the most wicked storms. Modern versions of these lamps are still used today as camping or survival lanterns. As it has become less necessary to have a hurricane lantern or lamp to light your home, candles placed within protective glass tubes or bulbs have again become popular. Candles are a little easier to store for “just in case” than lamp oil and are a little more attractive as well as usually having a better scent. But candles do tend to drip and their flame can flutter in the slightest breeze, so it is still handy to have them shielded from drafts. Therefore, hurricane candle lamps are again popular. More than that, decorative hurricane candle lamps can be an attractive part of your décor even when not needed as emergency lights. Some of them can even look as if the candle flame is floating independently above the table, while others resemble some of the fancy lamps that were introduced around the time of Queen Victoria. Hurricane candle lamps partake of some of that fanciness and introduce some kinds of ornamentation only possible with today’s technology. Here are ten examples of hurricane candle lamps for you to look at and enjoy. They are both decorative and useful. While electricity is usually reliable these days, you never know when you might need an independently powered light. It doesn’t hurt for it to be beautiful as well as useful. Set up to work with votive candles, this little holder is perfect for personal altars or meditation spaces. The little pebbles in the base of the holder give a touch of earth while supporting the wire frame that holds the candle. The frame can be removed for cleaning or for replacing the candle. Tall holders constructed from rough textured glass help refract light from candles. The holders are large enough to accommodate a three-inch pillar candle, which will be seated on a metal holder about 2/3 of the way down. Beneath the holder is space for you to personalize your hurricane candle holder with colored sand, coffee beans, or pebbles. This is a simple glass hurricane candle holders, banded with metal. The chimneys are sufficiently large to accommodate a three-inch pillar candle. Brought to you from Birch Lane, the Merrimack Hurricane Candle Holder will keep drafts away from your candle flame. The understated hurricane candles can easily be used at dinner parties or in emergencies. Rectangular pieces of glass bonded by gold colored metal create hexagonal enclosures for your tall candles. Designed to keep drafts away from candles, these elegant holders can easily grace your dining table as well as provide emergency lighting. The gold colored metal is really iron, so you can be assured that the frames are sturdy. Raise the light above head level with these beautiful contemporary metal and glass hurricane candle holders from Laurel Foundry Modern Farm House. Fashioned like the facets of a cut diamond, the open-work holder contains a hurricane glass sized for a tea-light. These lamps are good for parties and other venues where the lights need to be hung out of reach. 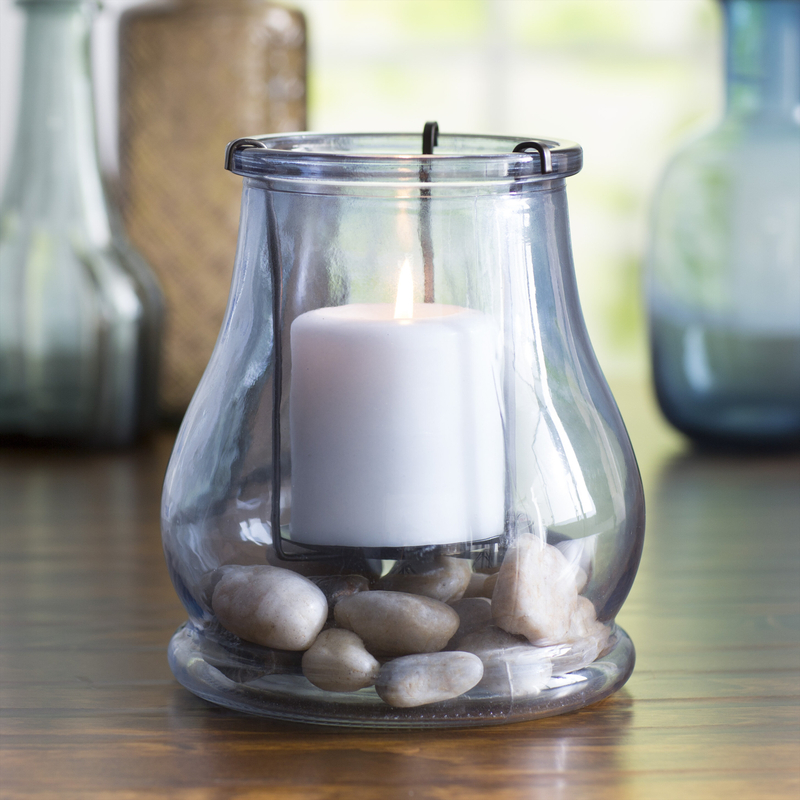 With a ceramic base and removable glass chimney, this hurricane lamp can accommodate a five-inch candle. It is recommended that this Alford hurricane lamp from Birch Lane should be spot cleaned, only, and that Sterno should not be used in place of a candle. Suitable for outdoor use, such as for the patio or backyard camping. The flared top of this Babson Park metal and glass lamp from Beachcrest Home gives an added touch of elegance. Combine it with burlap runners and companion containers wrapped with sisal cord for a bit of sea-going flavor. Sufficiently attractive to lend romance to a dinner for two, it also has practical value as an emergency lamp. Clear glass towers with drop-in votive candle inserts make the flames look as if they are floating. It’s perfect for dinner parties or for the candle-in-the-window effect, or for creating an atmosphere of mystique. The drop in votive holders can be removed for cleaning or for inserting and lighting the candles. The design comes to you from Red Barrel Studio. Wood and glass hurricane lamp will accommodate a large five-inch diameter candle. The wood base is carved for added rustic charm. It’s an excellent lamp for those long, blustery nights when the power has gone out, or just to lend ambiance to an evening of storytelling. With the large candle, you can read or meditate well into the night. Enjoy soft candlelight and the glitter of gold as the light sparkles off a band of honeycombed decorative metal. Both practical and decorative, this traditionally shaped hurricane candle holder will keep the chill winter breezes away from your candle flame. Whether you are simply enjoying a quiet evening or riding out a storm, it will do the job.